Flooding widespread near Truro after rain pounds N.S. 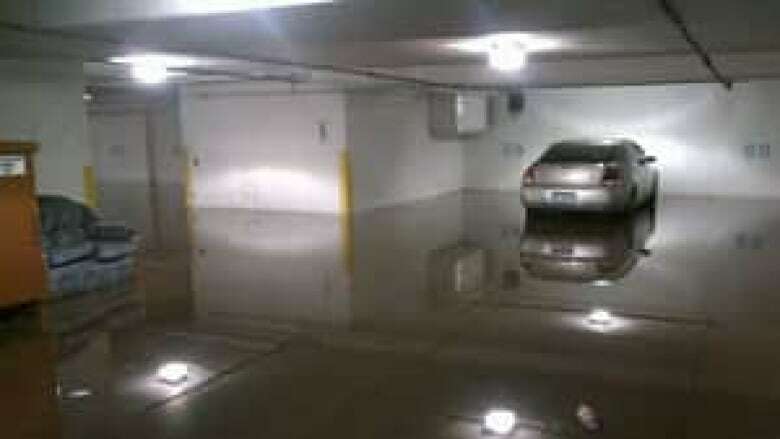 The rain in central Nova Scotia has let up, after about 75 millimetres of rain fell near Truro, washing out roads, flooding homes and causing dozens of families to evacuate on Monday. The rain is now starting in Cape Breton, with upwards of 125 millimetres expected overnight, according to CBC meteorologist Peter Coade. There were several motor vehicle crashes in Colchester County and roads in the area were closed as RCMP in Bible Hill asked people in low-lying areas to move to higher ground. Just after noon, the dike behind Stanfield's Clothing on Logan Street broke and the plant was evacuated. Parts of Farnham Road, Marshland Drive, Park Street and Prince Street were closed, as was the railway underpass between Truro and Bible Hill, known as the subway. Widespread flooding was also reported on Highway 311, where firefighters readied an inflatable boat to go door-to-door to rescue people affected by the flooding. "This is the worse I've ever seen it. We've been here for six years now and I've never seen the water this high. Never," said Nelly Schuurmans, who runs the Baker's Chest Tearoom and Bed & Breakfast on Farnham Road. "The road is completely blocked from two sides. We can't go out. We're really on an island now. Us and our neighbours and people across the street." Schuurmans said the flooding had essentially turned her home into an island. "I'm in my kitchen now and if I look left, I see there is a small river there which is completely flooded, there's a bridge there which has completely disappeared. There's no bridge anymore. It's still there, I hope, under the water," she said Monday morning. "If I look straight ahead of me there is a field where children are playing soccer usually, but that's a lake now." A spokeswoman for the Chignecto-Central Regional School Board said the Cobequid Educational Centre — the area's high school — was closing because of an "imminent flood risk." Buses arrived at 10:30 a.m. to take students home. There is also severe flooding in the North River area, just north of Truro. 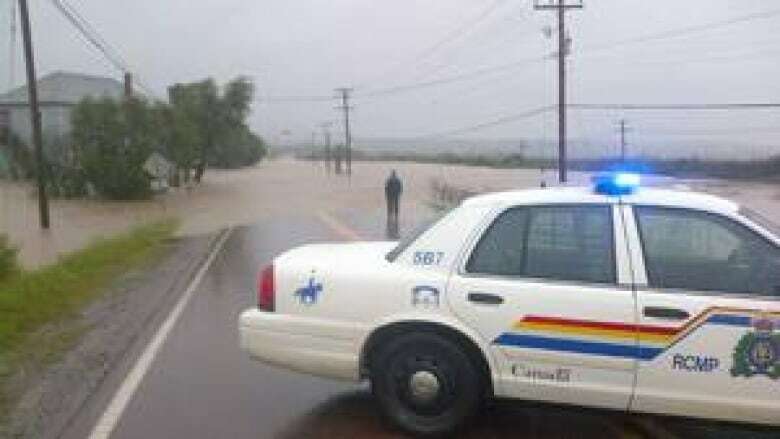 RCMP said the road near Stewart's Bridge was covered in about 1.5 metres of water. Members of the Bible Hill Volunteer Fire Department are helping to evacuate a trailer park on Farnham Road near the exhibition grounds. "They're trying to help people get out of their houses, put up barricades so people won't drive down the flooded roads," said Avis McNutt of the Bible Hill Volunteer Fire Department. RCMP and Halifax Regional Police warned drivers to slow down to avoid hydroplaning after the heavy rainfall. There were no reports of serious injuries. The entire province was covered under an Environment Canada weather warning. The Canadian Hurricane Centre said the heaviest rainfall would be in the areas along the existing trough and to the west of tropical storm Leslie, which include eastern Nova Scotia, Cape Breton and western Newfoundland. Leslie is expected to make landfall in Newfoundland on Tuesday.